WASHINGTON – The United States Mint will accept orders for the 2017 America the Beautiful Quarters Three-Coin Set™ – Ozark National Scenic Riverways (product code 17AF) on June 26 at noon Eastern Time (ET). The reverse (tails) design of the quarters in this set depicts Alley Mill, a steel roller mill built in 1894. This merchant mill was used to convert wheat into flour. Much of the original milling equipment is still in place, and visitors to the park can tour the mill. Inscriptions are “OZARK RIVERWAYS,” “MISSOURI,” “2017,” and “E PLURIBUS UNUM.” The obverse (heads) design features the 1932 portrait of George Washington by John Flanagan. Priced at $9.95, this set contains two uncirculated Ozark National Scenic Riverways quarters-one from the Philadelphia Mint and one from the Denver Mint-and one proof quarter from the San Francisco Mint. 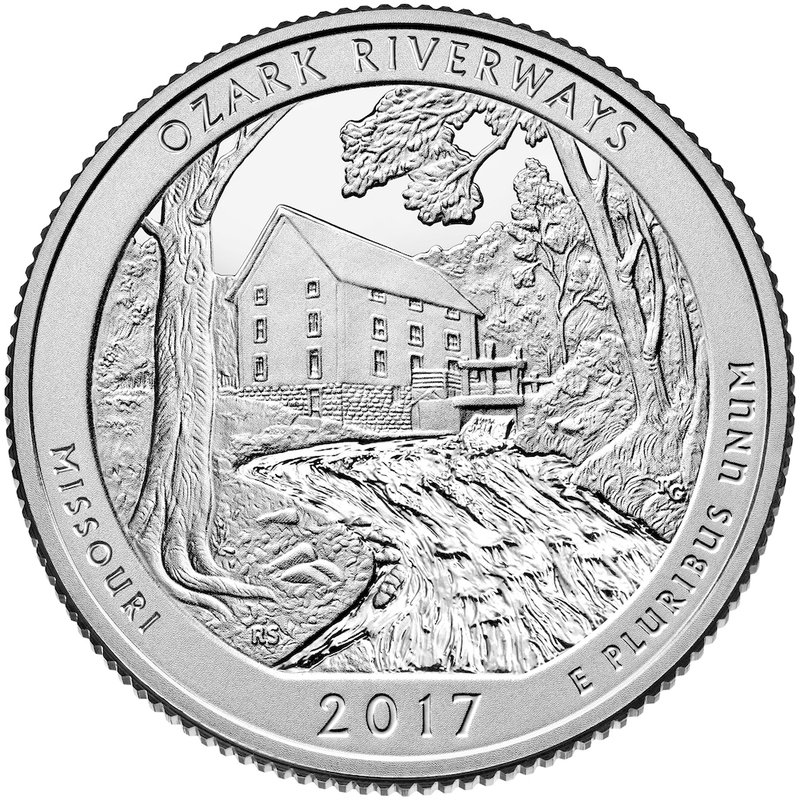 The coins are held in a durable plastic card with an image of Ozark National Scenic Riverways. A Certificate of Authenticity is printed on the back of the card. Orders will be accepted at the Mint’s online catalog and at 1-800-USA-MINT (872-6468). Hearing- and speech-impaired customers with TTY equipment may order at 1-888-321-MINT. Visit us online to learn more about our shipping options. The Mint also offers the America the Beautiful Quarters Three-Coin Set through its Product Enrollment Program. Learn more about this convenient ordering method here.